» Splint is obtained from native ash and hickory and from tropical palm trees. The native splint is cut from selected second- growth timber with straight grain. Ash splints, machine-cut to a uniform width, wear well. Hickory splints often vary slightly in width, giving a pleasing effect. The tropical palm tree from which materials like splint are made grows in the Indian Archipelago, China, India, Ceylon, and the Malay Peninsula. With-out its leaves it is known commercially as rattan. The outer bark, stripped in different widths, is sold as cane; the core, split into round and flat strips of different thicknesses and widths, is called reed. »Shaker Tape is made of 100% cotton webbing. 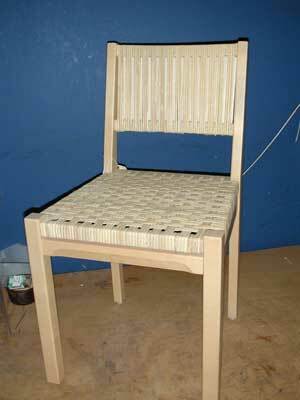 It is used to weave chair seats, foot stools, and as straps for many tote style baskets. Available in 5/8" width and 1" width.